The old wine game is a fun one. Every bottle is a lottery, with a definitive conclusion about how a wine ‘should’ taste a moving target. Still, half of the fun is about admiration – that ‘I can’t believe this still looks this good’ thought that great wines illicit. 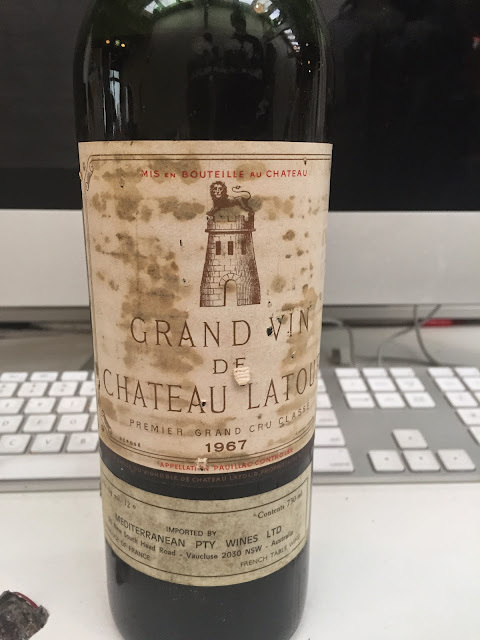 This old Latour – from a lesser vintage – certainly smelled good, with a freshness and aromatic intensity of wet brick, leather and cocoa that suggests glory. The high shoulder fill pointed to good storage and even the colour looked solid, with deep mahogany depths. The palate starts well, surprisingly silken and soft, almost ethereally soft and gentle. But then everything goes awry. Slowly, the resinous, horsehair edge of rising brett and butting acidity takes over, leaving a bad taste to what is 2/3rds a great wine. I can’t tell if this is indicative, but no more than a fragrant curio – it doesn’t give enough joy. Tasted: March 2015, Someone else’s bottle. Best drinking: Now – but it’s not falling over.